The stand-out fruit on the Tablelands in October is Diploglottis diphyllostegia, Northern Tamarind, with its numerous, spectacular yellow capsular fruits but this species was treated in TREAT NEWS, No. 24, November 1999. A tree that is very suitable for revegetation of coastal lowIand areas such as the Walter Hill Range near El Arish is Ficus drupacea, the Drupe Fig. This tree is currently fruiting on my place near Atherton, but its natural distribution is along the Wet Tropics coastal lowlands up to 450 m altitude extending to Cape York, SE Asia, Malesia, Solomon Islands and other Pacific Islands. The fruits are shaped like a football with blunt ends and vary in size from 12- 25 mm long x 10-20 mm diameter. They are a beautiful brownish red in colour with scattered pale cream dots on the outer surface. Fallen figs change to maroon red. Fruits are sessile (i.e. lack a stalk and occur in axils of leaves, where the leaf stalk joins the twig.). To humans they are father tasteless and could be eaten if really hungry. Like all figs they attract pigeons, fig birds, flying foxes and fallen fruit is- consumed by cassowaries, musky rat kangaroos and rodents. The name "drupacea", meaning drupe-like fruit, appears to be a misnomer as a drupe -is a fleshy fruit with a stony endocarp such as in a peach, an apricot or plum. There are certainly no stone-like structures within this fig. The tree is large and is often a strangling fig. Terminal stipules on the twigs can be 8-45 mm long and are covered with long brownish hairs when young. Broken twiqs rapidly produce milky sap. Leaves are dark green and tend to be held fairly stiffly. They tend to be mesophyll In size and have 8-12 pairs of lateral veins distinctly raised on the upper surface, which form loops close to the leaf edge. 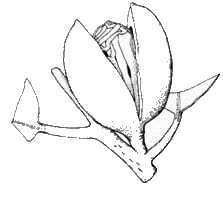 The midvein is also distinctly raised on the upper leaf surface. The petiole is virtually not grooved on the upper surface of most leaves. Oil dots can be seen in the upper surface of the leaf when viewed with a hand lens. The lower surface when viewed with a lens, presents "islands of schematic, curly treetops as viewed from above in a landscape plan or a map." Young leaves are light green in colour and have rusty hairs on the petioles (leaf stalks) and young twigs. Fig species often have small specific wasp pollinators and unless the fig flowers within the fig body can fertilise themselves in the absence of the pollinator, F. drupacea trees grown on the Tablelands are unlikely to produce mature seed as the specific wasp pollinator is not likely to be present on the Tablelands. On Saturday November 18th, this annual workshop will be held at the nursery, starting at 2pm. Tony Irvine will explain how rainforest trees can be identified by their leaves, wiht many specimens to examine. The nursery staf will discuss seed preparation, germination and practical steps in tree rearing. This interesting workshop is always very popular, so register early at the nursery to ensure a place. Three committee members that served TREAT well during the last year and also previous years were not re-elected at the recent TREAT AGM held in August. As the President during these years I would like to thank these three members for their contributions. Glenda Zeck served the committee well as a minutes secretary and also in helping to regularly compile the newsletter for posting. Glenda put in some telling points from time to time and added humor when at times meetings were becoming too serious. Glenda decided not make herself available for re-election. Ted Fitton has and still is doing a great job on the publicity side for TREAT and is responsible for the excellent poster displays at our various meetings, planting days, at other community events and local libraries. Ted felt that he was not really contributing to the discussion of meetings and that he really did not need to be on the committee to continue the publicity position. Ted is far too modest and he certainly did contribute to meeting discussions. Peter Tuck has certainly served the committee well. Peter was one of the main drivers behind the commencement of revegetation along Petersen Creek which aims to make a corridor connection between Lake Eacham and the Curtain Fig Forest. Peter sounded landowners out along the creek system and persuaded some of them to attend a field day at Donaghy's Corridor. I can remember Peter bringing the committee back to earth after this event when he commented that on the field day, some of the presenter's were commenting on how the corridor was enhancing the habitat for White-tailed Rats and Bush Rats as well as other fauna. Peter made the point that he did not think that such dialogue was going to present positive vibes to the landholders that he brought along. Despite this setback Peter persisted and played a big part in winning some of the landowners over and hence the Petersen Creek plantings began. Well done to all three members and thank you. Traditionally the months of July through to September represent a quiet time of the year in the nursery, with all plantings for the season complete. During this time nursery staff focus on site maintenance involving herbicide application to control weed growth and limit competition on planted trees. However, this year has not seen the anticipated quiet time as the Centre is increasingly developing programs and initiatives other than the primary focus of ecological restoration. In addition to restoration, the Centre undertakes significant farm extension work, student training, research activities and supports similar initiatives in Australia and overseas. Later this month the Centre hosts visitors from Madagascar and the UK, and in December, visitors from Germany and Thailand will arrive. Three German students will be undertaking practical work as part of their studies, and two Thai's will be undertaking two months of intensive training, mainly in restoration but also in fire management, conservation planning and nursery management. This training is funded by QPWS and a Danish conservation organisation, and stems from contacts made by Nigel Tucker during his visit to Thailand earlier this year. Syb Bresolin and Warren Canendo have continued developing and delivering Cross Cultural and Caring for Country training material for indigenous communities, students, QPWS staff and other government agencies. Both Syb and Warren are to be congratulated for their efforts and outcomes achieved. As part of the Forty Mile Scrub Rehabilitation Project, Geoff Onus delivered Nursery Management training to Queensland Corrective Services inmates from the Yarramulla Work Camp. Prisoners will now be responsible for production of stock for planting within the National Park enhancing project momentum and equipping those participating with new and useful skills. Members have had the opportunity to meet various academics who have visited the Center over recent months as part of the Cooperative Research Center's Program 5 - Rainforest Rehabilitation. Restoration techniques developed by the QPWS and TREAT are of particular interest to these scientists, as are several rehabilitation plantings such as the Donaghy's and Petersen Ck corridors. Members would be aware of the new rack and rail production system now completed within the outside hardening bays. Space efficiency, nursery hygiene and Workplace health and safety are now greatly improved. Geoff and the work for the dole participants deserve a pat on the back for their efforts. The greenhouse extension is due to proceed in early November at which time the new nursery irrigation system should be operating. Staff have completed work on the retired QPWS field caravan which will now accommodate visiting researchers and students. Unfortunately indigenous ranger trainees Neil Standley and Curtis Nehow were unable to continue their 12 month traineeships, however both extended thanks to TREAT members for their warm welcome and support. On a brighter note, Nigel returned to the helm mid October after a period of leave during which time he was able to (almost) complete his thesis as part of his Masters Degree. The full complement of staff will be complete in February again when Tania Murphy returns to her role as Assistant Manager which I'm sure all members are looking forward to. The Centre is interested to hear from members who have access to native rainforest trees producing fruit. If you have remnant trees on your own property (or maybe your neighbours) the Centre would like to hear from you or perhaps bring a sample in on Friday mornings for identification. This would assist the nursery and TREAT with their seed collection as well as maintaining a healthy genetic variability within plantings. You have done your planning ahead with the aim of getting the right tree in the right place at the right time and for the right purpose. Now what comes next? You have selected the site; so now you need to do the groundwork to get that site ready for planting out. Ideally all site preparation should take place during late winter and early spring so that planting out the seedlings can commence when reliable summer rains occur. Good site preparation means an extra 3 to 6 months growth during the first year. Previous or present wildlife on the site. You can now prepare a site plan, marking the location of permanent features such as any changes in soil type, creeks and rivers, land slope, existing vegetation to be retained, roads or tracks for vehicle access during and after revegetation and new or existing fences to exclude livestock. During your planning, you decided which method of revegetation you would use - (a) the framework species method; (b) the maximum diversity method; or (c) the natural regeneration method. To a large extent, your choice of revegetation method decides which species you will be planting. Based on your choice of species and your knowledge of the preferred habitat of the different species, you can now mark the possible planting location of the different species on your site plan. Your next step in preparing the site should be to consult with the property owners, neighbours and community groups - unless you have done this during the planning stage. The final planting and post-planting operations will go much more smoothly if all landholders and people involved with the tree planting contact each other and discuss future events. One of the most important acts during site preparation is the removal of unwanted vegetation. Remember to retain the useful native vegetation - some pioneer species may already be present. Also, if the site is prone to erosion eg. a riverbank, consider leaving some cover or grass strips to reduce erosion risk. It may take some time to remove or kill unwanted vegetation. Therefore, clearing the site should commence some 3 to 4 months before the planned date of planting. Because the soil may be left more exposed during this operation, clearing should take place when there is the lowest possibility of heavy rainfalls so that the likelihood of erosion is kept to a minimum. If the site is overgrown with woody weeds such as lantana (Lantana camara), giant bramble (Rubus moluccanus) or privets (Ligustrum spp. ), hand labour or a small bulldozer can be used to slash the weeds. Regrowth can be sprayed with a translocated, non-selective weedicide to kill the roots, or the stumps can be removed by grubbing them out. If the site is an old pasture, the grass and herbaceous weeds can be killed readily by spraying with a translocated, non-selective weedicide, such as Glyphosate (refer to product label for application rates). Any newly germinated weeds such as thistles (Sonchus spp.) or Blue Tops (Ageratum spp.) can be controlled by Glyphosate. Leave all dead plant material on the site as mulch. The dead roots will help stabilise the soil until the tree roots take over this role. Some sites, such as old established pastures, may need to be deep ripped to allow easier penetration of water and growth of tree roots. Always follow the contour during ripping. Never rip steep slopes, stream banks or creek and river flats. Be aware that soil disturbance will stimulate weed seeds to germinate. Members of TREAT can obtain established seedlings of many suitable species of trees through the organisation. Contact one of the office bearers listed in the TREAT Newsletter for further information. Germinating and raising your own seedlings is easy, satisfying and cost effective. Collecting seeds from your local area means you are using species adapted to your local conditions. But remember, permission must be sought whenever you collect and it is illegal to collect seeds from within protected areas such as National Parks without a permit. Trees growing in remnants of rainforest on private land are a good source. Regularly monitor the selected seed trees so that you know when the fruit is ripe and ready for harvest. Collect the fruit directly from the trees whenever possible; rodents, insects or fungi quickly damage fallen seed. Keep your collections separate and label them clearly with the date of collection, species name (if known), and locality (for rechecking later if the species name is not known). The method used to extract the seed from the fruit depends on the type of fruit, but all methods attempt to mimic nature. Because there are many different types of fruit, each needing a different method to extract the seeds, seek local technical advice on the best method to use for the species you have collected (see below for some local sources of technical advice). The seed mix must drain freely, but hold sufficient water to keep the seedlings alive between watering. A coarse, open mix is best - do not use natural soil because many are too fine for good results. A suitable mix contains 50% coarse sand from freshwater streams, 25% vermiculite or perlite, and 25% peat, sawdust or other organic material. Do not add fertiliser to the seed raising mix. Use shallow trays and sprinkle the seeds evenly over the seed mix. Cover the seeds with a thin layer of the seed mix if the seed is very fine, such as in Paperbark or Bottlebrush (Melaleuca spp. ), or a layer of light, coarser gravel or scoria (about 10 mm size) if the seeds are larger. Water the seeds immediately after sowing to settle the mix around the seeds. Always use a misting or fine droplet sprinkler head when watering. Keep the seed mix moist throughout the germination period and place the tray in an airy and well-lit location (not in direct sunlight or direct rain). Always raise the seed trays some distance above ground to prevent attack from rodents. The seed mix can be used to pot the small seedlings into pots for growing on as seedling stock. An alternative mix is one that contains up to 75% composted fine bark and 25% coarse sand from freshwater streams. Add nutrients to the mix at this stage - use organic fertilisers (eg. blood and bone) or commercial slow-release fertilisers at the recommended rates to provide a continuous supply of nutrients for some 4 to 6 months. Most species can be potted when the seedlings are between 30 mm and 60 mm high, but some larger fruited species may reach 300 mm before leaves are produced. When transplanted, immediately water the seedlings and transfer them to a shade-house or similar sheltered location. After 3 to 4 weeks, the seedlings can be moved into a sunnier position and finally into full sun where they are hardened off ready for planting out at the revegetation site. PO Box 1119, Atherton Qld 4883. McLeish Rd, Lake Eacham Qld 4884. Year 11 and 12 students at Atherton High School now have their nursery in full swing, sowing seeds and potting up seedlings for revegetation projects focusing on Type 5b or Mabi Forest. During Semester 1, students learnt the basics of nursery management and propagation of rainforest plants and are now applying their knowledge to grow trees for a Mabi Forest Planting in the school grounds and also their major revegetation project at Halloran's Hill. Special thanks to Maria Gillanders who has been volunteering her time at the high school to help the students out and keep them on track with correct sowing and potting techniques. We aim to develop an ongoing program at the school where students will continue to grow Mabi trees for future tree planting projects. The project provides a worthwhile and local focus for the school's Horticultural/ Agricultural studies and hopefully involves more young people in tree planting initiatives. Ever tried to strut around like a cassowary?? Several eager Year 6 students from Tully Primary School recently tried their hand or (should I say wing) at some cassowary capers at a few of the coastal plantings of the Walter Hill Ranges Project. The outing was one of the TREAT on TAP Environmental Excursions we usually run in Semester 2 of the school calendar. Students collected local Blue Quandong seeds (Elaeocarpus angustifolius) and carried them to a nearby 1998 planting site where they direct seeded them, mimicking the role of the cassowary as an important seed disperser. A 'tree hunt' activity helped develop plant identification skills and the morning was topped off by a cassowary impersonation competition. Many thanks to the TREAT volunteers and CTR staff that helped make the day a success and to all those who have contributed to TREAT on TAP for 2000. The reward of many smiling children's faces is one not easily forgotten. Morgan Reece, one of the Tully students, enjoyed the day immensely and sent a wonderful email thanking everyone involved. Morgan said 'I think that we should have conservation in El Arish - I had a dream that in my yard we started conservation and I enjoyed it. Thank you very much for every thing, I am most delighted'. The next Environmental Excursion will be held at Malanda Environmental Park for two Year 4 classes from Malanda Primary School and will conclude the TREAT on TAP activities for another year. Anyone interested in getting more involved with the TREAT on TAP program can talk to Tania Murphy or Joan Wright. On Saturday November 4th TREAT members will be able to visit plantings on one of the most eroded creeks in the district. Marie Beckworth has invited members, especially those who worked on the creek banks with her some years ago, to meet us at 2pm. She will show us the good progress of the plantings and the continuing prolems on the creek. Location: Lot 3, Ti Tree Road, Carrington (near Atherton). Phone 4091 1475. TREATWISE is an 11 minute video about TREAT's aims and activities which we have produced using a grant from Perpetual Trustees (Hayles Bequest). The video shows our TREAT working bees at the nursey and some major tree plantings. There are shots of school children at work on our TREAT on TAP program. Many familiar faces and TREAT personalities are featured as the action moves along. TREATWISE was made by Peter McCabe of Gecko Video Services. The specially designed cover was produced by Tableland Secretarial Services. Copies are now available for purchase from Joan Wright or at the nursery on Friday mornings. The cost is $20. Our TREAT Christmas party for this year will be a sunset cruise on Lake Barrine. A bit different don't you think? At 5pm we shall meet on the boat at Lake Barrine, bringing the refreshments we would like to share for the next hour and a half. If you can, please tell Joan Wright if you plan to come. The boat holdds 50 (Someone who can sing sweetly to a guitar would be very welcome!!). On one of my regular visits back to the glorious Tablelands, I am delighted to learn that my stay coincides with the September field trip to Donaghy's Corridor. This innovative project has been co-ordinated by the Parks and Wildlife Service - Centre for Tropical Restoration and the local tree-replanting group, TREAT. On September 2nd, around thirty people gather at Donaghy's farm, keen to see the results of four annual plantings by the community. In all, 20,000 trees have been planted between 1995 and 1998. What an uplifting and inspiring sight spreads out before us as we round the crest of the ridge. Meandering along the creek, like a giant green serpent, is a continuous canopy of trees. At both ends of this wonderful vision are dense areas of rainforest, hitherto unconnected. Through the labours of the Parks Service, TREAT and the community, a lifeline has been restored to the wildlife of Lake Barrine. The creatures living around this beautiful crater lake are no longer isolated but are free to venture out along the creek, into a wider world. Nigel Tucker leads us through the yearly planting sections, beginning at the 96 planting, on to 97 and 98, and finishing at 95. Through his knowledgable commentary, we are able to discern the subtle differences in growth rates of the newly created landscapes around us. He creates a lively vision for us of the creatures that are now using this corridor and names a wide range of trees which surround us. Over 100 local species have been used to link the isolated 500 ha Lake Barrine section of the Crater Lakes National Park with the much larger (80 000 ha) Wooroonooran National Park. This is the first tropical forest corridor to be constructed in Australia, and special attention has been given to planting rare or threatened species, and food plants for important wildlife like Musky Rat Kangaroos, Flying Foxes and possums. Nigel and other researchers are now undertaking detailed studies about the corridor's impact upon the local animal and plant life. Initial results from these studies appear very positive and indicate, even in these early stages, that the corridor is being well used. The seeds of this project were first sown in 1994 when the Parks Service talked to the Donaghy family about building a linkage along Toohey Creek. Around 16 ha of the Donaghy farm has now been used for revegetation, to create a corridor about 1 km in length and 70 to 100 metres wide. Adjacent grazing cattle, which once made their way down the eroded banks of Toohey's Creek, are now permanently excluded from the corridor and creek by fencing. Today, these animals get their supply of clean creek water through a series of watering points established on the property by this project. As well, hoop pines have been planted adjacent the edges of the corridor as a windbreak/buffer and for future farm timber. So there have been mutual benefits to farm productivity and conservation and a positive outcome achieved for all parties involved. In 1999, a Nature Refuge was declared over the corridor which is binding on title and protects the corridor in perpetuity. As a former Tablelander and TREAT member, I was most interested to see this remarkable project which is showing spectacular results even at this early stage. The field trip was a highpoint of my stay on the Tablelands and I congratulate all those who have contributed to its success.